It’s been almost two months now since I started riding Dunnie. 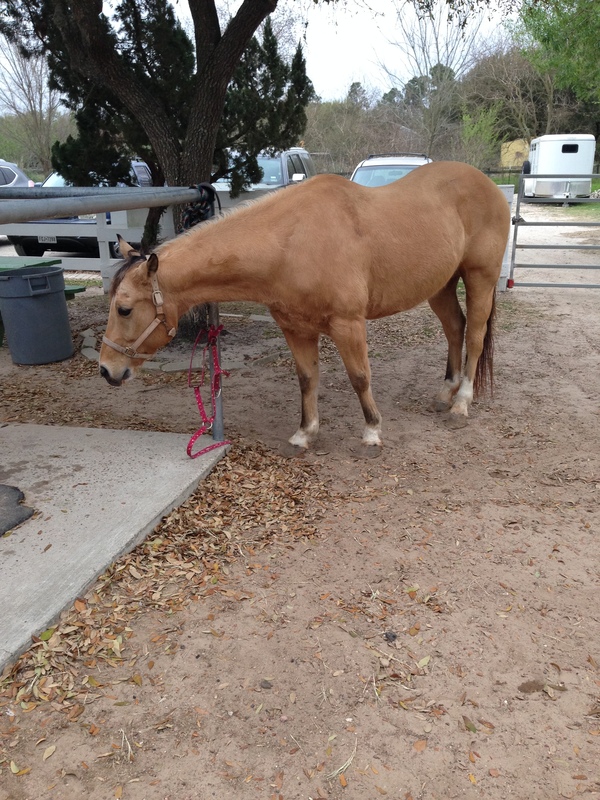 The day I met him, I went out to the barn knowing almost nothing about him; I knew that he was a reining horse and that he had won 3rd place at the International Buckskin Horse Association’s World Show several years ago, and that he was much loved at the barn. 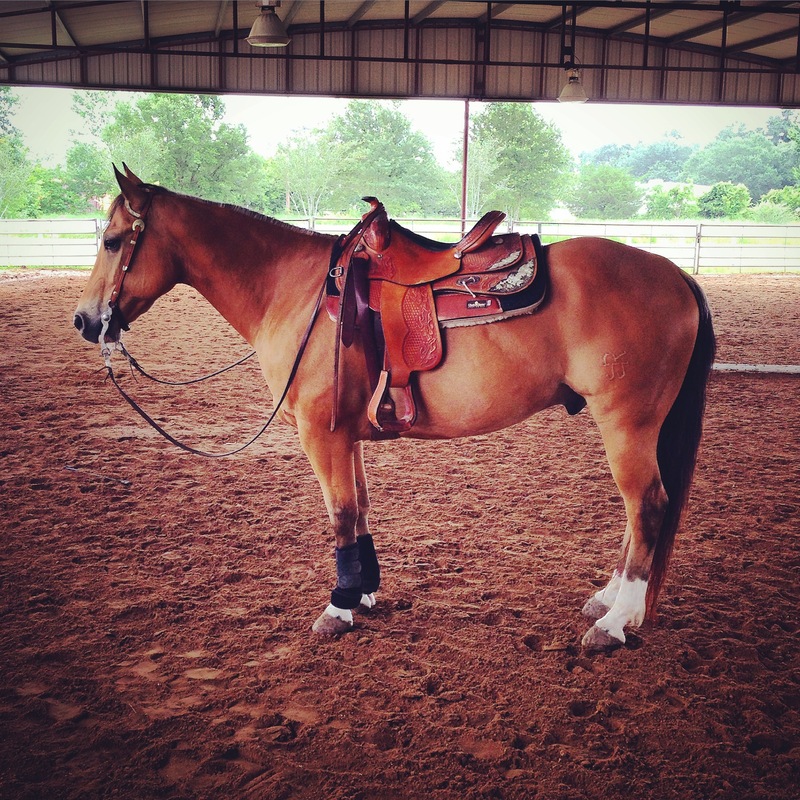 I had no idea what to expect, and, having just about zero knowledge of reining, no idea really how to measure him. When he came out of his stall, I thought he seemed a little small, a little pudgy, and very shaggy with a thick, hay-colored winter coat. Dunnie, on the first day I met him in April 2016. But I reserved judgement, trying to learn as much as possible about him. He had been leased for a while by a woman before me who rode him a couple times a week; she’d had to move away because of her job. He’d been pastured outdoors in the winter, which accounted for the unusually heavy coat in a place where it doesn’t get all that cold. Of course, once I got on him, I immediately fell in love. He was so easygoing, so willing, that I knew right away for sure that I wanted to lease him. The first time I groomed him myself, I realized just how much coat he was shedding. In five minutes, I’d have several curry-combfuls of his light-colored winter coat drifting around the ground. But underneath, I could see glimmers of the shiny, golden coat that must have inspired his show name, which I learned through some Googling is “Boomtown Gold.” I began to get excited about cleaning him up, and threw myself into grooming him really well every day that I rode him. Dunnie’s golden coat shining in the sun on his withers. Slowly, more and more of that undercoat emerged. 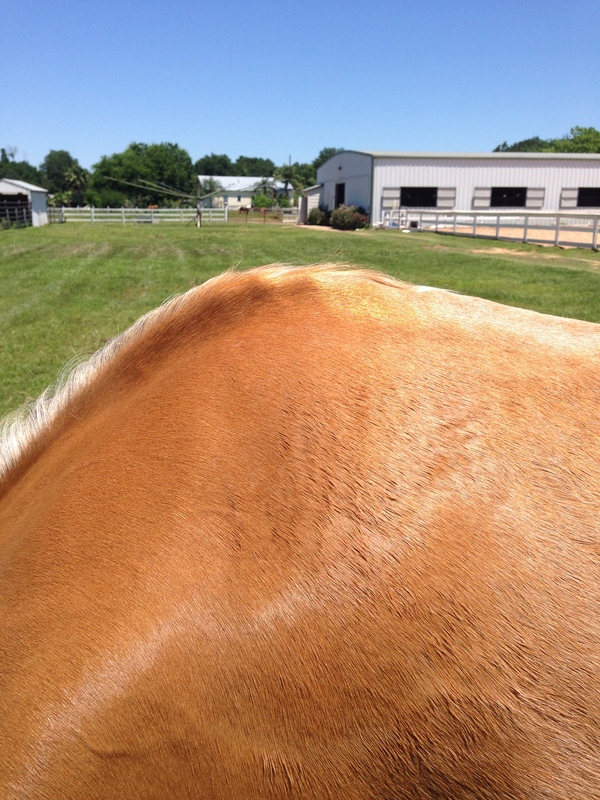 One day while grazing him, I looked over at his back and saw the sun shining off the spot on his withers where all the winter coat had come off. He was still shaggy around his belly and thighs, but here was a glimpse of what he’d look like once he finished shedding. We’d had an especially good ride that day, I felt I was getting stronger and making progress on learning reining techniques. As I reflected on how lucky I felt to be where I was, doing what I was doing—how lucky I was to have stumbled upon Dunnie—I looked at him and felt like I’d struck gold. I’ve ridden him every chance I’ve gotten for the past two months, weather and work sometimes making that tricky, but I keep finding a way. Most of the time it’s just us out there, with me doing the best I can to be the leader, taking him through the exercises I’ve learned from my trainer and from reading and watching everything on the Internet related to reining in order to build up his muscle and flexibility and get his mind and body back into competition shape. Simultaneously I’m his student, letting him teach me how to communicate with him so we can do the tricks he already knows how to do and that I’m just discovering for the first time. When we’re out there together alone, we work—the riding I’m doing now is the most focused, most directed, most in-depth riding experience I’ve ever had—but it’s also play. I can feel him responding with interest to every new game I pose, every challenge. “What if we try this?” I ask and he says, “I’m game!” Sometimes we do great and I’m amazed at how easy it is. Other times it’s not perfect, but we gave it a good try and so we move on, saving it for another day. People at the barn have started commenting on the change in Dunnie. My trainer says she can see him getting more fit; others have commented on how much happier he seems, how much friendlier he is in his stall. Someone mentioned that he’d been allowed to get away with quite a bit prior to my arrival, and that he seems to be responding really well to me. It’s so wonderful to hear these things. There’s probably no greater compliment I can receive than “You are making things better,” and when that specifically includes making someone else happier and healthier, well, it doesn’t get any better than that. He’s making me better, too, making me learn patience and chipping away at my stupid perfectionism. It’s a trope our society presents frequently in stories: the makeover—whether drastic and overnight, or subtle and gradual—the idea that something or someone new comes into your life and fills an empty space and you become visibly different, the changes on the outside reflecting the changes occurring inside. Sometimes, even when it is gradual, it can be startling, as it was the other day when I tacked up Dunnie and brought him into the indoor arena. I put his reins up on his saddle horn and left him standing there a moment while I dragged a stray jump standard out to the edge of the ring, and when I turned back and saw him, I was amazed. The winter coat is completely gone now, and he’s lost weight and toned up. With his fancy saddle and his ears perked up, he looked like the champion showhorse that he was before, and hopefully will soon be again. Dunnie, looking handsome at the end of May 2016.